Mike's Auto Recycling is proud to offer a full range of car maintenance services to vehicle owners located in the greater Venice area. 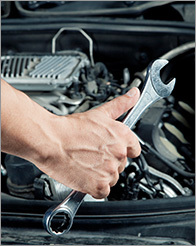 Regular Venice car maintenance is recommended for any vehicle to ensure that no problem goes undetected. Regular car maintenance also helps your vehicle run smoothly and efficiently and, in most cases, saves customers a lot of money. Indeed, a poorly running vehicle, while it may not show any signs of malfunction, tends to guzzle more gas than a fine tuned one. All information provided is provided for information purposes only and does not constitute a legal contract between Mike's Auto Recycling and any person or entity unless otherwise specified. Information is subject to change without prior notice. Although every reasonable effort is made to present current and accurate information, Mike's Auto Recycling makes no guarantees of any kind.